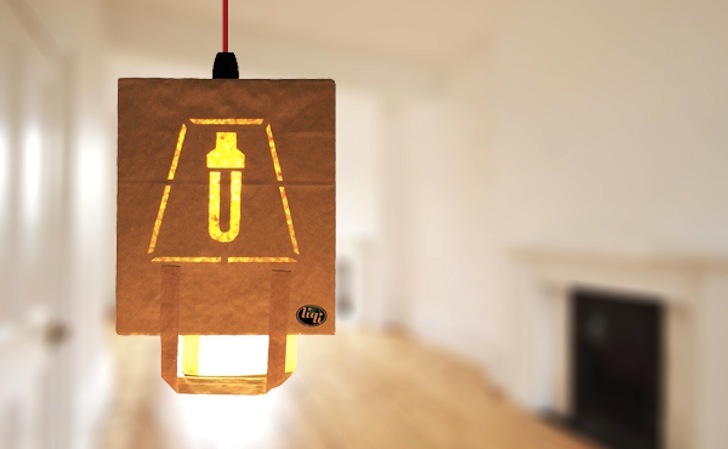 British furniture studio Liqui Design breathes new life into the everyday paper bag by transforming it into an item of high-end design. In keeping with the studio's commitment to aesthetically pleasing yet functional eco-friendly design, each light in the Bagalight Collection uses an A rated energy-saving bulb and is made entirely from paper and card. In the Bagalight line, Liqui Design applies the transformative power of design to an ordinary item to challenge preconceived ideas about the value of design. Inhabitat first spotted these quirky paper bag lamps at the 2014 ICFF show during New York Design Week. 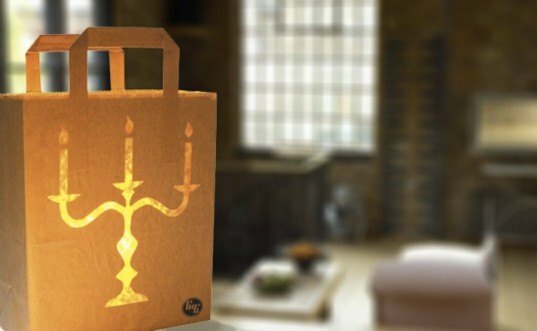 Each bag features a cutout of an iconic light fixture, from a candelabrum to an oil lamp. The energy-efficient light bulb casts a warm yellow glow through the translucent, cartoonish cutouts. Related: The Best Green Designs From ICFF 2014! For the cutouts shaped like hanging pendant lamps, the bag is flipped upside and a red electrical cord connects the light to the ceiling. Liqui Designs currently offer eight different styles in the Bagalight line, each with a free downloadable 3D SketchUp model. The bag lamps are of uniform size and measure 31 cm by 23 cm by 12 cm. Inhabitat first spotted these quirky paper bag lamps at the 2014 ICFF show during New York Design Week. Each bag features a cutout of an iconic light fixture. A cutout of the classic and elegant candelabrum. The energy-efficient light bulb casts a warm yellow glow through the translucent, cartoonish cutouts. For the cutouts shaped like hanging pendant lamps, the bag is flipped upside and a red electrical cord connects the light to the ceiling. Liqui Designs currently offer eight different styles in the Bagalight line, each with a free downloadable 3D SketchUp model. The bag lamps are of uniform size and measure 31 cm by 23 cm by 12 cm.